Bowyer started 12th and finished third. Bowyer and his three Stewart-Haas Racing (SHR) teammates ran in the top-five on the opening lap. Took four tires during a lap-25 caution and raced in sixth. Climbed to third by lap 49 and kept that position, surviving a wild one-lap shootout to end the stage. Bowyer started sixth and finished second. Restarted fourth and moved into second on lap 72. Reported that his car was tight, but the handling improved through the run. Pitted from second on lap 87 and restarted third. Bowyer started second and finished first. Took two tires for track position and restarted outside of teammate Kevin Harvick. Raced side-by-side with Harvick to begin Stage 3, then took the lead coming out of turn four. Led the final eight laps before rain forced officials to red flag the race. 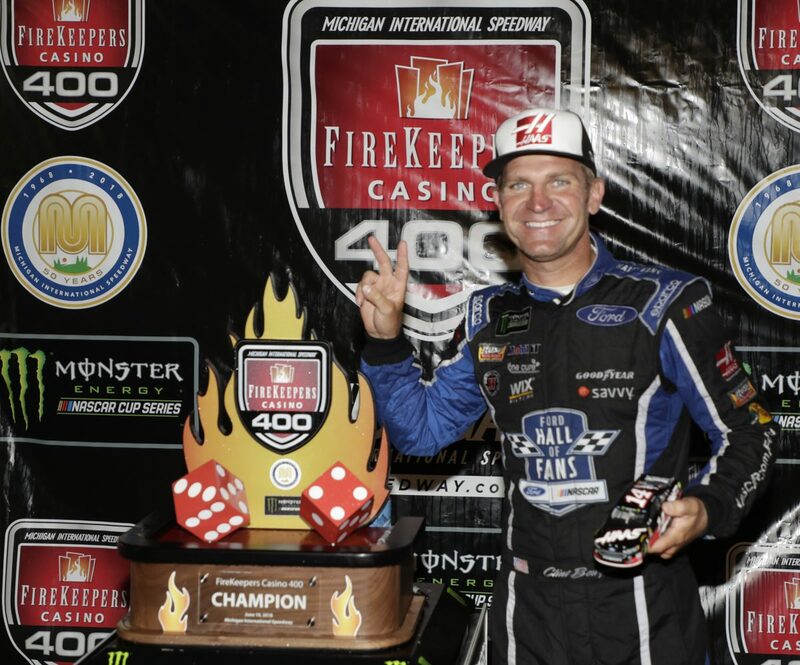 Bowyer’s victory in the FireKeepers Casino 400 marked the 51stoverall win for SHR. It was the organization’s 46thpoints-paying Monster Energy NASCAR Cup Series win and its second at Michigan. This was SHR’s 10thCup Series victory with Ford. The team won its first race with Ford when Kurt Busch captured the 2017 Daytona 500. Bowyer was followed by SHR teammates Harvick and Busch to secure the first 1-2-3 finish in SHR history. This was Bowyer’s second Cup Series victory since joining SHR in 2017 following his previous win earlier this season, on March 26, at Martinsville (Va.) Speedway. This was Bowyer’s first victory in 25 career Cup Series starts at Michigan. Bowyer led the final eight laps to bring his career laps-led total at Michigan to 36. With the win, Bowyer earned five playoff points. He finished third in Stage 1 to earn eight bonus points and second in Stage 2 to earn an additional nine bonus points. There were eight caution periods for a total of 30 laps. Twenty-nine of the 39 drivers in the Firekeepers Casino 400 finished on the lead lap. The next event on the Monster Energy NASCAR Cup Series schedule is the Save Mart 350k on Sunday, June 24 at Sonoma (Calif.) Raceway. The race starts at 3 p.m. EDT with live coverage provided by FS1 beginning at 1:30 p.m.